Spreader Jar-met 500 kg of mineral fertilizer hinged Jar-met Inside a bunker located mechanical agitator providing uniform flow mineral fertilizers to the dampers. Next, the granules get on CDs. On they have special blades that capture portions of fertilizer and under the influence of centrifugal forces scatter them on the ground. 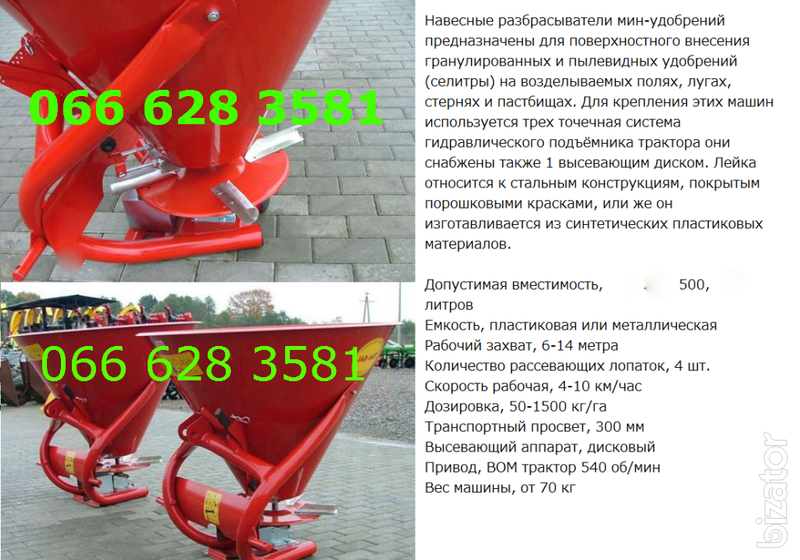 For uniform spreading over the whole working width there is no adjustment of the blades, specific position is selected given the rate, specifications, characteristics fertilizers and working speed tractor. The drive of all rotating parts is PTO. Inside the hopper is placed a mechanical the agitator provides uniform the flow of fertilizers to the flaps. Next, the granules fall on CDs. They have special blades that capture portions of fertilizer and under the influence centrifugal forces throw at them the ground. 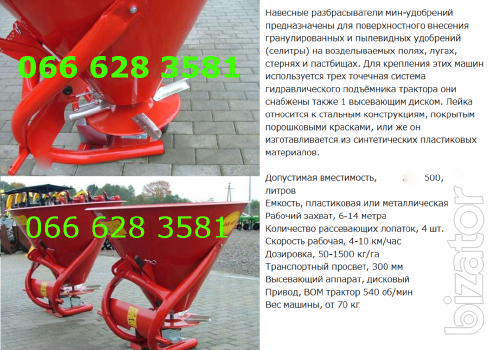 For uniform spreading across the width of the grip is additional adjustment of the blades in a specific position is selected based on the seeding rate, characteristics of fertilizers and working the speed of the tractor. Drive all rotating parts is PTO.